Gatineau River Swim July 2016. 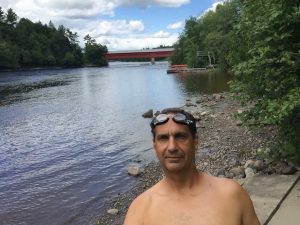 Last week in swam the Gatineau River starting south of Maniwaki and finishing in the Ottawa River. The day of my swim I drove up to Maniwaki, this time I decided to hide and store supplies along the river, 4 areas. Items that I placed were jugs of water, bananas, bagels, apples etc. I met the Grand Chief Jean Guy Whiteduck of Kitigan Zibi of the Algonquins First Nations which is located south of the city of Maniwaki. Chief Whiteduck convinced me to start my swim near the airport because the rapids are too dangerous to pass where my plan start area. The first half of my swim is felt like I’m in the wilderness, many birds I saw and fish jumping. Water temperature was ok, water cleanliness was average. The Gatineau is an tough, long, weedy and rocky river, the most difficult times were the portaging the Dams and rough water. The portaging zap a lot of my energy. My day job is I’m an busy Contractor who works all over Ottawa and area, it’s not difficult to find motivation when I’m tired or discourage, I just think of the kids who are patients at CHEO and the Assistance Living Residents, they give me my strength and courage. Swimming pass Gracefield then towards Wakefield then Chelsea was nice, I knew I was approaching Gatineau then my finish at Rockclife Marina. My next swim is the Rideau which will give me the Tripe Crown Swim Rivers of Ottawa. Overall experience. Totally Exhausting & Priceless!!! !